Day 766-771 My Birthday, A Facebook Message, The Salty Snacks, and Pictures! 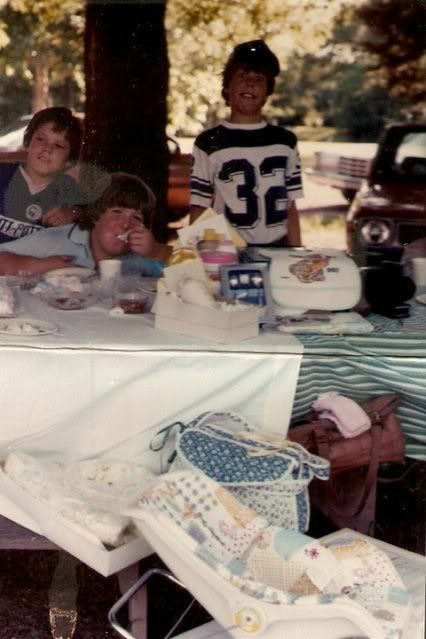 My Birthday, A Facebook Message, The Salty Snacks, and Pictures! Saturday the 23rd was my thirty-ninth birthday. And even though I don't necessarily like the idea of quickly approaching forty, I couldn't be more thrilled about a birthday. Age thirty-nine is poised to be the most rewarding, personally and professionally, than any other year in my life. As much as I like to kid around about being "upset" over growing older, deep down--it's contrary. I'm still young and since losing all of this weight, I feel like my entire life has been redefined, opened up to a fresh new start where anything is possible. My weight loss makes me feel like a kid again, with unlimited potential--unaffected by the turmoils of life and the restrictions we grow to believe exist. This freedom, well--it's amazing really, so thirty-nine? No problem. It will be what we make it, because if I've learned anything in the last 771 days, it's this: The outlook for the future is determined by the attitude I apply and the choices I make along the way. Saturday was busy from start to finish. 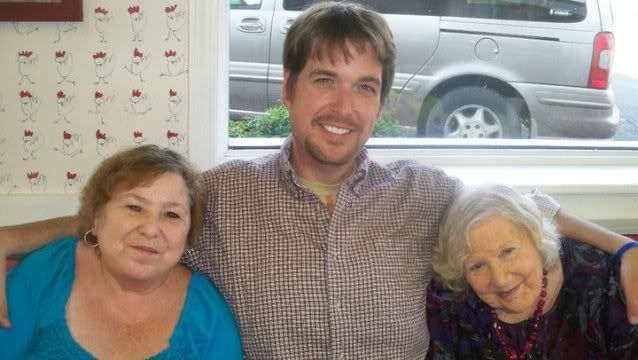 So busy, in fact, that I postponed the Anderson family birthday dinner for me, until Sunday. By 10am, I was making my way South to Stillwater for the OSU Homecoming game tailgate party, then I enjoyed the afternoon game (not really--Nebraska won), and then headed back to Ponca City for an REO Speedwagon concert with Courtney. The day started early and ended after midnight! Sunday was Day four of my birthday celebration. Amber, her boyfriend KL, and Courtney made the trip to Stillwater with me and we met my mom, aunt Kelli, grandma, and Keith at one of our favorite little places, Charlies Chicken. On the way down to Stillwater, I called the Hideaway--another favorite restaurant of mine, and ordered their famous fried mushrooms. I love their fried mushrooms, they're the best I've ever enjoyed. And boy, I have seriously enjoyed them in the past. A whole order to myself was what the Old Sean would have wanted--not Sunday, I wanted an order because I love them, but I wanted to share them with everyone at my birthday dinner. Instead of gorging on them, I shared with nine other people. That's all I needed and wanted. I still spent about 100 calories on those incredibly tasty little things...oh my, they're the best! 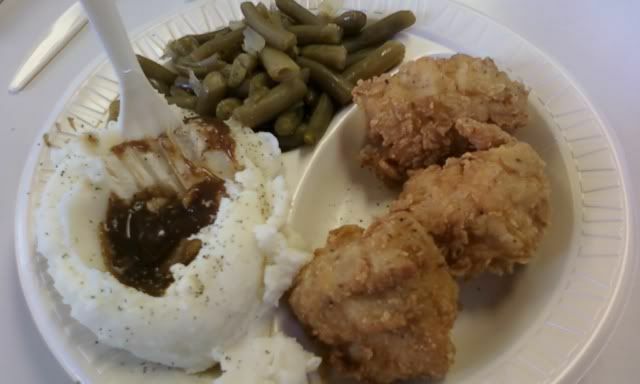 My calories would be spent on the best chicken breast "chunks" known to man, some mashed potatoes with a little brown gravy, and some green beans. Again, I told them to keep the roll. Rolls are good, but it was simply a calorie value decision--and it always is, when it comes to bread. We took some fun pictures at this dinner--see them below! I've spent some calories lately that I'm really not proud of, but it certainly reminds me--I'm no superman. We have a kitchen at the new studios inside the Poncan Theatre and it is frequently stocked with salty snacks. Snack mix, nuts, pita chips, pretzels, and more. Lately, I've found myself "investing" a little more calories in these items than I know I should. 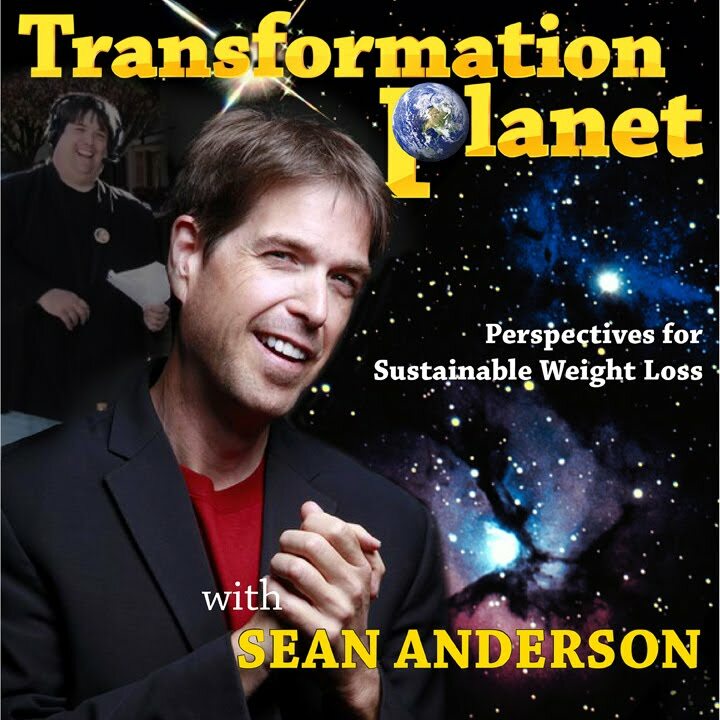 My confidence tells me, "you're Sean "flippin" Anderson, you can eat a little of this stuff, you can handle it within your calorie budget." And that's true, but two or three hundred mindless calories just isn't smart calorie management, for anyone. And just telling myself, Well--you're aware, and that's the important part, isn't good enough. Because at a certain point, that type of thinking quickly becomes a rationalization for bad choices. "At least I know what I'm doing isn't good." What kind of craziness is that thought process? Knowing right from wrong doesn't excuse bad choices. And a couple of hundred calories of snack mix, to me--at this point in my evolution of good choices, isn't acceptable. Wow--OK, that helped me to write it out...thank you blog!! Christi: Just so you know where im at w/ this journey..not sure i ever told u but....I am 58 yrs old , 5'3", weighed 225lbs & had gastric bypass 3 yrs ago and lost almost 70 lbs and am gaining it back and already getting the old aches and pains associated w/ OBESITY back and Im SICK OVER IT... am trying so hard to start over and make it work this time & i get so determined then weaken and go thru the cycle over and over and over and WHY cant i make it stick and be consistent like I know i HAVE to be to do this? 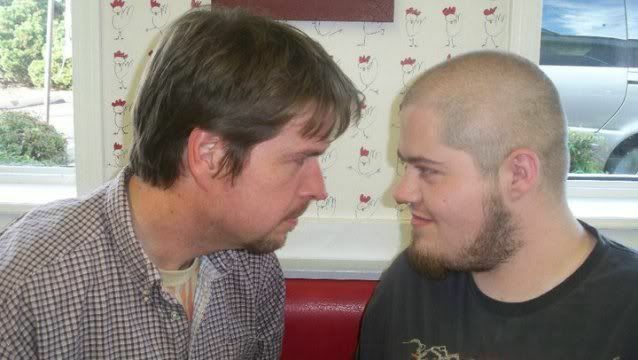 anyway thank you for your inspiration.. i will NEVER give up until i whip this prob...you have a beautiful family Sean and i see you are a wonderful father and son!! 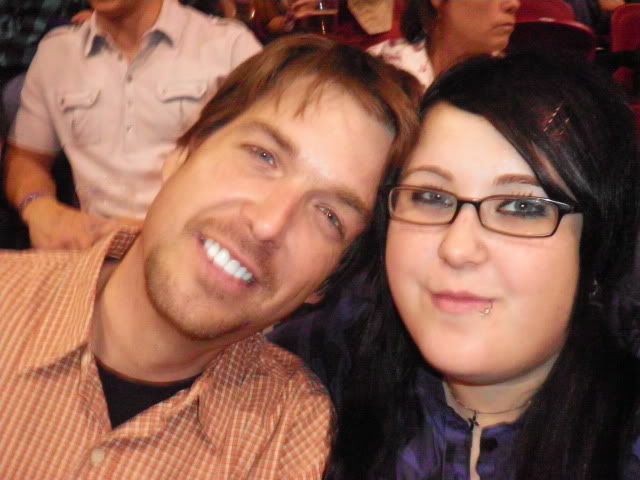 =0) I admire you greatly & wish my husband & I could meet you all someday! Christi: Oh my ... Well im sittin at my desk at work (Upper Ia University) and I got this and BOOM..MADE ME CRY!!! HAD TO SHUT MY DOOR!! But it will help me more than I can tell you.. I will read this and reread it!! Such good advice and great words, thank you Sean. In your upcoming book, I hope you touch a lot on how you sooo persevered during the TOUGH TIMES!!! THIS TRULY MAKES YOU DIFFERENT FROM THE REST OF US....THE HOLIDAYS, THE SOCIAL ENGAGEMENTS ECT..this is my killer!!! I can do sooo damn good then boom lose that determination & drive during a tough food & drink tests! I am getting it tho that YOU DO HAVE TO WANT THIS MORE THAN ANYTHING ELSE IN THE WORLD....THAT STEEL CURTAIN HAS TO ALWAYS BE THERE...plus your fabulous concept of the CALORIE BANK & TRUST..I LOVE THAT!! I also beleive being prepared is everything too..being a food ADDICT I will die when I walk in here each morning & theres homemade cream cheese frosted carrot bars or CHOC brownies in the break room..& I would sell my soul for one.. but if i have "something" diet smart to get thru that I do well... this is the kind of things I MARVEL AT YOU FOR...HOW YOU GET THRU THEM... 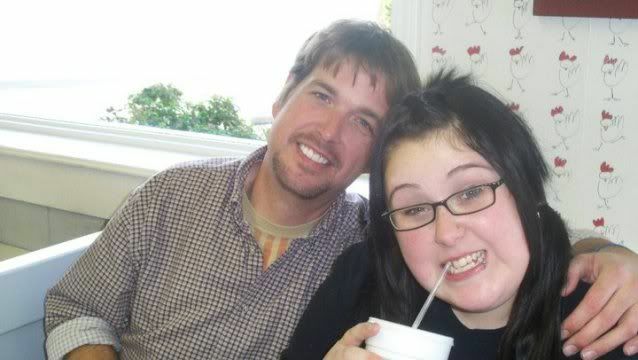 I KNOW YOU WERE A FOOD ADDICT TOO AT 500 LBS SO HOW DID U CONSTANTLY GET THRU GIVING UP THESE FOODS... oh i know you say "dont give em up..have a lilttle..bank on them..." But Sean how did u get to point where you could do that THEN STOP W/ A LITTLE?????? HOW DOES AN ADDICT EVER DO THAT!!!!!!!!!!!!!!!!???? Me: Remember, I'm still a food addict, always will be. I'm recovered, but aware. How does it work? If you want this to be the very last time you ever need to lose weight---If you want to make this THE TIME when you really do it, for real...You must realize the vital element of dropping the excuses and rationalizations that make us feel better about bad choices. You must remind yourself how important this entire journey is---you must embrace 100% self honesty and self responsibility in your choices and circumstances. When you do that---you realize, it's not someone's fault if they brought something yummy or the restaurant's fault or the holiday's fault...or anything or anyone else. It's us and our choices. We have the comfort in knowing that we can still have anything we want---there's no deprivation, but we also know that we have a Calorie Bank and Trust account that must remain intact--the integrity of that calorie budget is and must be maintained, because when we start making rationalizations to "break it," or "have just a little more, or just this time," those thoughts and actions are the beginning of the end. And the end, well--that's a very sad place. "Oh well, we'll start again some other time," right? NO--this is the time, now--today---we must embrace consistency---that's how I lost 212 pounds the first 365 days---It was consistency....maintain it, take pride in it, defend it from your emotions and circumstances at every turn, and get ready---because amazing results are coming your way. And those incredible goodies...make sure you eat some every now and then...because that's what normal people with normal, healthy relationships with food, do. Vital elements of success: Importance level, plus self-honesty, plus consistency, protected by our steel curtain zone, and staying true to ourselves and our calorie bank---and doing some kind of movement, exercise of some kind---anything---simply walking...and the weight flys off. It really doesn't matter what you eat---remember, keep it simple---and as the weight drops and your good choices naturally evolve, then you can get fancy with nutrition if you desire...right now, if you want to overcome food addiction---embrace food as your friend, all food---and do the things I've talked about here...Christi---I'm telling you---sweet success, sweet freedom from obesity and all of the negatives it embodies. You're on your way my friend--congratulations on your good choices!!! Get ready to fly! Christi: OMG WOW IS ALL I CAN SAY... WOW... Sean that is unreal, that is sooo powerful..soo sooooo true... hit me where i need it...yep that is it & i will now reduce that msg and put in my wallet then i will blow that msg up and post on my mirrors and in my car and poster it to my bedroom door!!! ha... you are amazing..soo soo good... yep you're right , i have to be accountable and stop crying about what im giving up!! WOW SEAN!! OMG ... WOW!!!!!!!!! Me: You must give up the idea that you're giving up something. You're not giving up anything...You're gaining a control, a relationship, an understanding and clarity that will forever change you, inside and out. A relationship with food and yourself--and they're relationships without struggle, because the insane war is over!! Food is your friend and you are your friend---and the circumstances of life---sure, they come and we survive because we realize the answer to us feeling better isn't in any kind of food we seek for comfort. We recognize that emotional eating creates a horrible vicious cycle---where the comfort creates more problems and the problems send us running for more comfort. You have the power to stop it with your good choices. Christi: OMG SEAN... please know that that was the most profound piece of intelligent, awesome, mind blowing...information this voracious reader has ever everrrrrr read!! So well put... soo sooo well!! I cherish it...& I don't know how to tell you how much it HIT ME ..your response was everything & more that I needed to answer my HUGE MOST IMPORTANT questions that I slung to you!! I guess all I can do is to prove to you how much those words impacted my thinking BY SHOWING YOU W/ MY SOON TO BE LIFE CHANGING, PERMANENT, WEIGHT LOSS!!! Thank you again ...thank you Sean for your time...& wisdom & well just everything...THANK YOU!! *& hugs******* !! "I had macaroni and cheese and a big grilled cheese sandwich for dinner. I told you yesterday, the Food Network really got to me. I need to block that channel! I wonder how the cable company would respond if I called to have them block the Food Network? That could be funny. Me: “I want that filthy-dirty-tempting-sinful channel off my service!” Cable Company: “No problem sir, we can take the adult pay per view choices away, we're very sorry you were offended.” Me: “No, you don't understand, the Food Network is my vice.” I bet they've never had a call and request like that! I should do it just for fun. By the way, my mac and cheese dinner with a grilled cheese sandwich weighed in at a very appealing 530 calories. It was wonderful and well within my calorie budget for the day. I even enjoyed a Blue Bell Dream Bar after our incredibly intense workout. That's the thing that some people have the hardest time understanding. How can you eat Dream Bars? And mac and cheese? And mashed potatoes with gravy? And pizza? And fried mushrooms? And Snickers Ice Cream Bars? And Lasagna? And fried catfish? And so many other non-diet sounding things and still lose weight? Well, I'm also eating more vegetables than I ever have before, and I'm really appreciating well balanced meals, and I'm learning what a portion is suppose to be. I'm counting calories and budgeting those calories to last all day long. I'm giving my metabolism something to chew on several times a day and into the evening. I'm drinking a lot of water and water based zero calorie drinks. And I'm getting the heart rate up with a cardio event like walking and racquetball play. So it's not all Dream Bars and pizzas...But it's the beauty of this plan that I can enjoy them anytime I want...if my daily calorie budget allows, of course!" A single comment came to that early post in February of 2009, from Ginger in Canada. She writes: "Reading about your progress and determination is very inspiring. I'm trying to develop the mindset to start this journey myself and start making better choices...consistently. Unfortunately I still undermine my own efforts and end up with false starts. I did feel inspired enough today to go for a walk in spite of the cold temperature." I better wrap this post. I have two weight loss speaking engagements on the horizon. Monday evening for a small church weight loss group in Ponca City and Thursday the 4th of November at the Ponca City Country Club. I'm so excited! 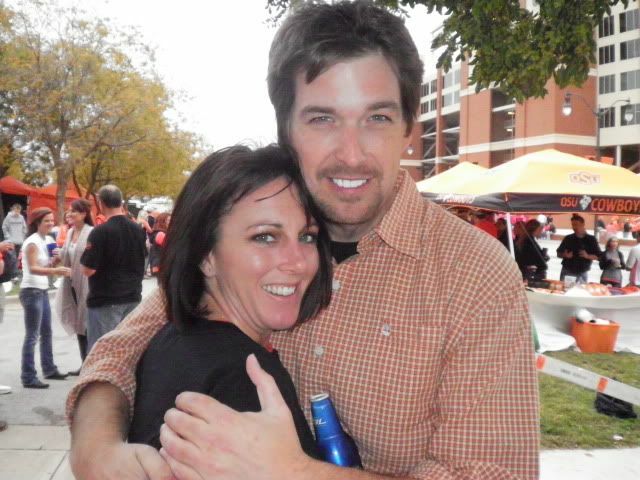 With Whitney, outside a chilly Boone Pickens Stadium on Saturday. 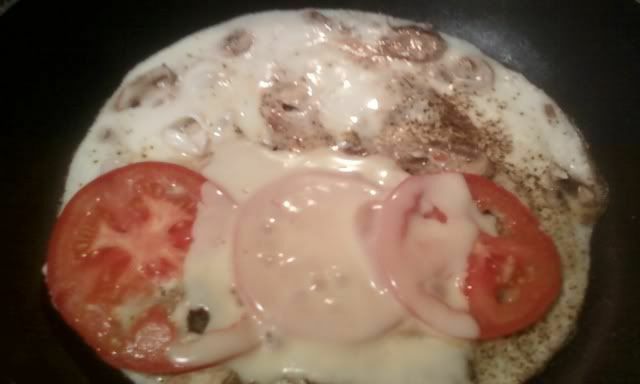 A recent breakfast: Egg-white omelet with mushrooms, mozzarella, and tomatoes---all wrapped in part of a Joseph's Lavash flat bread. Sometimes, we don't see eye to eye. ;) We were having so much fun!! 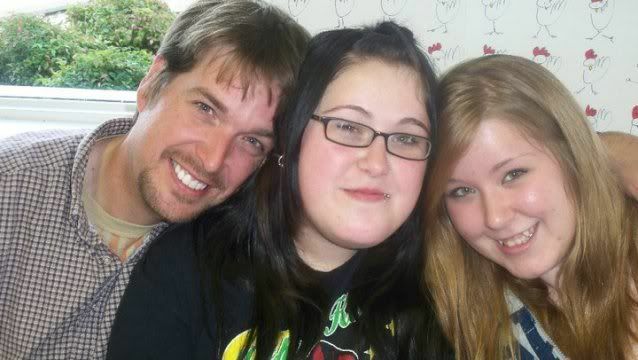 The two most important people in my life. We are so, not tough. But we're silly sometimes and that's a little more fun! It was supposed to be the "Two Boxers" pose, but KL couldn't stop smiling. 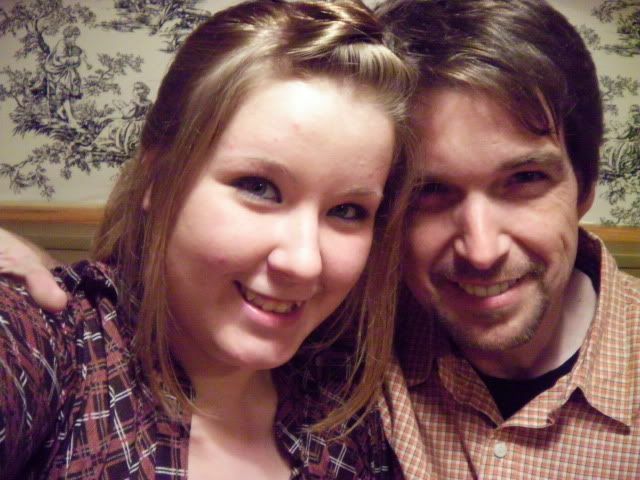 My youngest daughter!! So beautiful, so smart--incredibly talented, this girl---wow, I'm so lucky!! 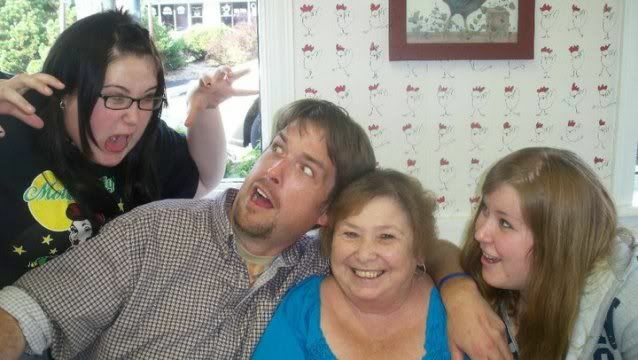 Can you tell we love to have fun? The girls and me with mom! My birthday dinner. Loved it! Not pictured: The 100 calories worth of Hideaway mushrooms. 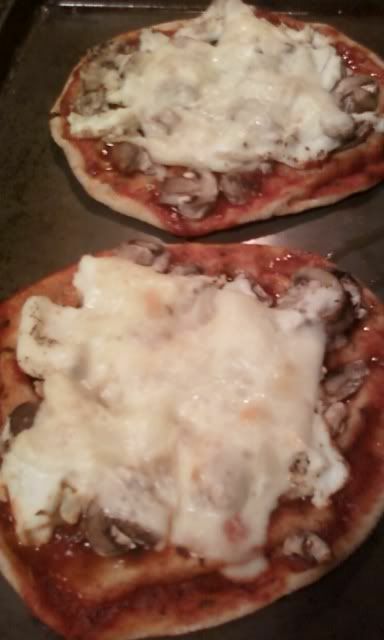 Two breakfast pita pizzas. 320 calories total--for BOTH, together....Uh yeah, incredible calorie value!! 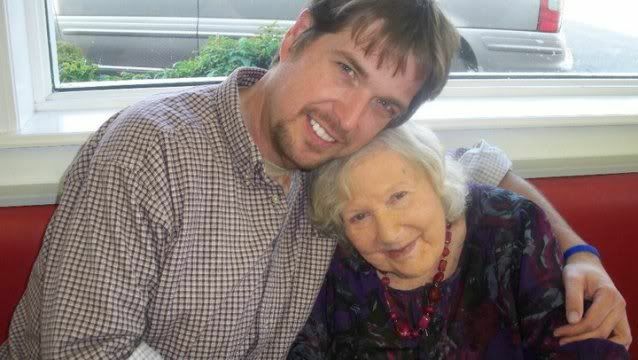 With my dear sweet grandmother...She's so precious to me. Before at this same restaurant--nearly the same spot...over 500 pounds. Found it! Thank you to my sweet daughter Amber for putting these two shots together. These photos were snapped in the same spot, a few years apart, obviously! I sincerely appreciate the kind words recently messaged me by regular readers who have written out of concern, over the lack of an updated post. Let me assure you, everything is going wonderful, absolutely! I've just been extremely busy and focusing my writing energy toward the manuscript of my upcoming book. The more I write, the more excited I become--I can't wait for you to be able to read what has and will continue to consume me over the next couple of months. One thing is for certain, it will be worth your time...count on it! Hey, it's a dream sequence, and dreams get crazy! They were really giving it their best shot today. In just a few mile stretch, I drove past several different signs all just begging me to come in and forget about this little journey. The first sign read “half price ice cream and drinks 2-4pm”...No Sean, keep it together...Then-- “two corn dogs 4 a dollar” ...nice try!---then “Try a Banana Pudding Shake” Stop it!...the next sign was “Try our new oven baked sandwiches” It didn't work last Thursday, and it's not working today! ...then it was “Large Frozen Yogurt Waffle Cone $1.79”...Then a big banner with the most delicious picture of a big, gigantic, king sized Mushroom and Swiss burger, with the invite-- “Try a Mushroom and Swiss Steakhouse Burger.” No King! Leave me be! Before I could get to the safety of my garage, I drove by a banner picture of a foot-long chili cheese coney...It was the size of my van! Have mercy! I can't help it, I'm a sign reader! I've always been a sign reader... I wonder what their strategy will be tomorrow? Whatever it is I know I'll survive, cause I'm determined my friend. They would have to come out into traffic and stuff the food in my mouth by force at the stoplight, and if that happens, well...we'd have to reach some kind of low calorie peace accord with these nuts. I'm done now. That was fun. "If he gets to Day 100," nice. This is day 766. Yeah--take that, quick and easy temptation foods--You no longer control me! I was looking at my bare feet the other evening, when I realized, hey--my feet have lost weight too! I knew of these slimmer feet before, because instead of 13 or 14, I now wear a size 12 shoe, just like when I was thirteen years old, but I never really stopped and examined them closely. I can see tendons, veins, and bones. And then I noticed my incredibly high arch on each foot. How in the world did these arches hold up over the years? I have no earthly idea, really. I'm just really lucky, very blessed--indeed. The more I thought about these feet and where they've been and the job they've handled, without fail all of these years, I decided--they need something special. A while back, Dr. Amy, a good friend of mine, offered a detox ion foot bath. I think it's time to take her up on the offer. These feet deserve every wonderful minute and benefit of a detox ion foot bath. After carrying around over 500 pounds for nearly twenty years--never breaking, never failing in any way, shape, or form---these super feet of mine, well--they deserve a break, a detox...and maybe some new socks. I love new socks. I was at a remote broadcast the other night when I was approached by someone I hadn't seen in years. Jeanne Votaw is a regular reader now and a facebook friend, after re-discovering me when AOL featured my story on their welcome page headlines in mid-July. 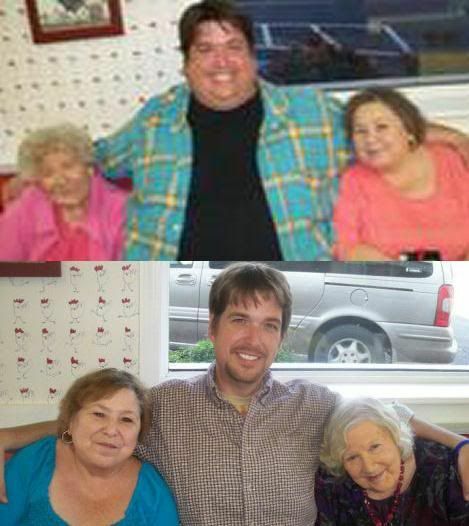 I say re-discovered, because Jeanne and her husband Jim remember "old" Sean---over 500 pound Sean, from more than 15 years ago when I lived and worked in their hometown of Perry, Oklahoma. Jeanne lost 160 pounds years ago and has successfully kept it off. She transformed long before the age of weight loss blogs, and was and continues to be an inspiration to her family and friends, and to me. 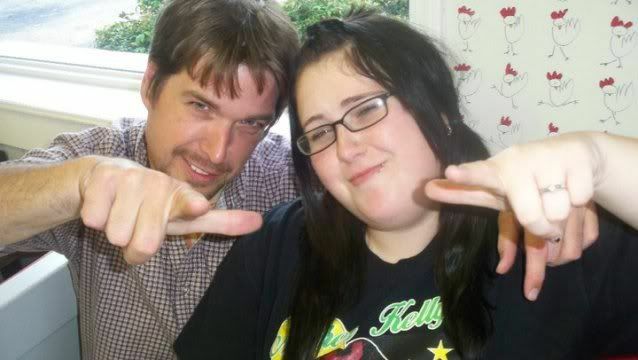 She blazed this Transformation Road long before I ever found the on-ramp. That's why Jeanne relates to and understands my perspective and weight loss philosophy. She appreciates it and enjoys reading, she tells me. 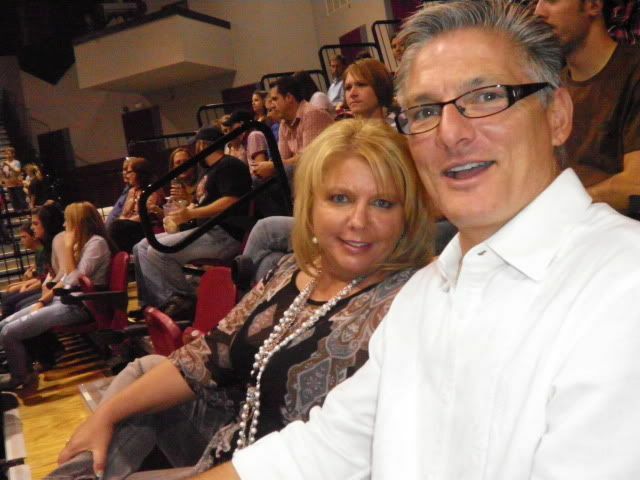 Her husband Jim was at the broadcast too--he's also found a way to lose over 60 pounds. They're incredible people, and I'm very proud to call them friends. Jeanne and I found a moment to snap a picture, it's below!! 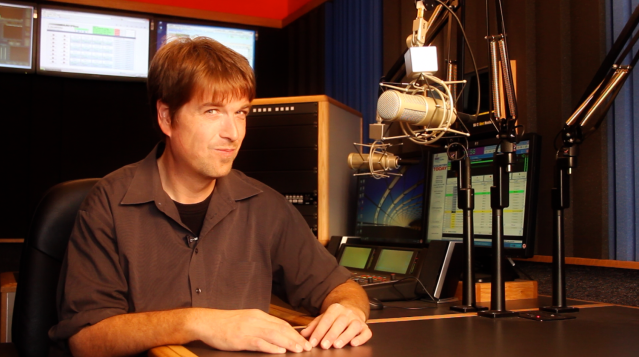 It was a wonderful way to wrap up a three to seven pm broadcast, after a really long and busy day. Amber arrived home from school for fall break late Wednesday evening. It works out perfectly too, because Saturday the 23rd is my 39th birthday, and she'll still be here! 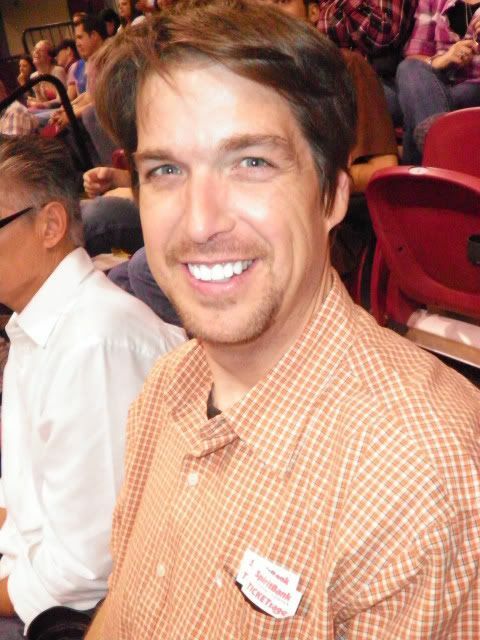 Thursday afternoon, Amber and I attended a graveside funeral service for my dear Cousin Ronnie, then we headed to Tulsa to meet up with Sherri and Terry. 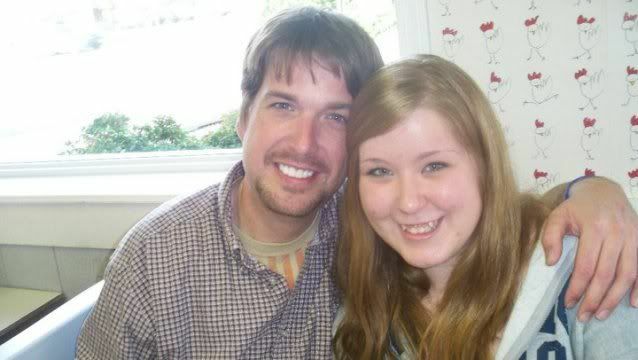 Sherri is my cousin, and along with her husband Terry--operate a successful insurance services company. Sherri is also my business manager, which sounds crazy to say, but really isn't at all. 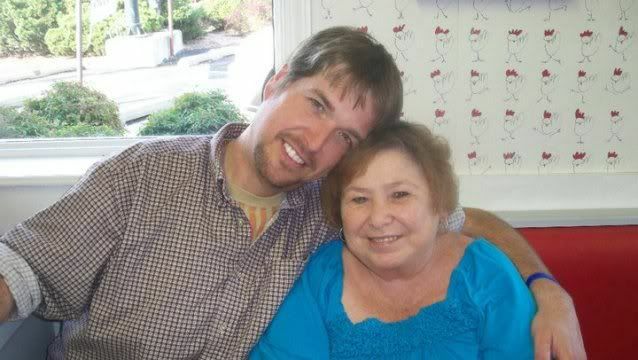 She's known me since birth, probably changed my diapers, and I couldn't think of a better business person to look out for my best interest, than someone who has always genuinely loved me. 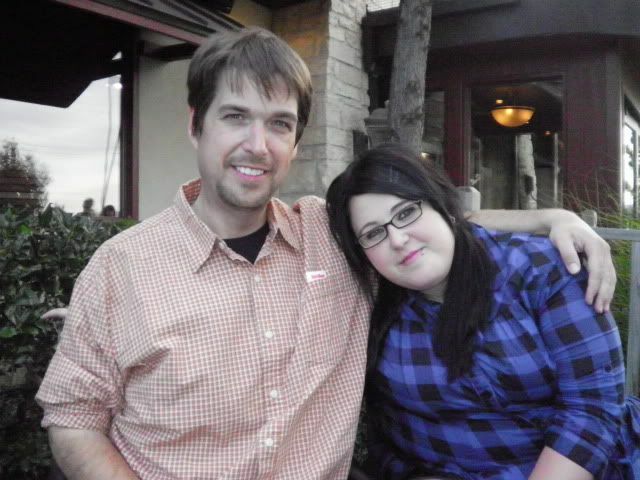 Sherri and Terry treated the two of us to a nice dinner at a place called Cheddars (see the pictures below) and then we headed to The Spirit Bank Center in Tulsa for the Miranda Lambert and Eric Church CMT On Tour concert. It was an amazing evening, very exciting--and a wonderful time for Amber and me to enjoy each others company. We talked all the way to Tulsa and most of the way back, until I let her take over the driving, and I was out. We dropped into bed shortly after 2am. With a 5am alarm set and a radio show to start at 6am, I was setting up Friday to be a caffeine filled day of exhaustion. Luckily, my boss allowed me to split the day in half---allowing for a nice long mid-day nap. It was exactly what I needed!! "REO Speedwagon's “Time For Me To Fly” isn't a song about the end of a relationship between two people---Oh, it is---but to me it's about my break-up with obesity. I must have listened to that song five times tonight. It empowers me around that trail." Thank you so much! I hope you'll friend me on facebook if you haven't already. We have regular weight loss related discussions on my facebook wall--and many of my friends post about their incredible weight loss success. I love the connection it creates...so friend me, please! And also--if you haven't noticed yet---I've started Tweeting on the Twitter. The last five Twitter Tweets will always show along the left hand side of this blog. On facebook, just search for me using my email--- seanboy105@hotmail.com and on Twitter, I'm @SeanAAnderson. 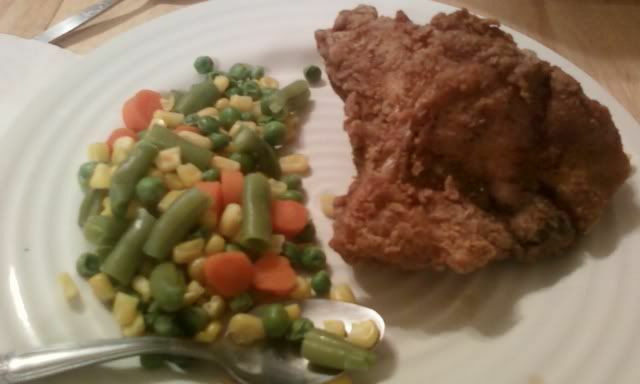 Notice the absence of potatoes on that plate---Just a fried chicken breast and mixed veggies---it was all I needed and I was satisfied. I love mashed potatoes, but this meal was designed with my calorie budget at the moment in mind. so no potatoes. The 400 calorie fried breast shorted me...but it was so delicious!!! 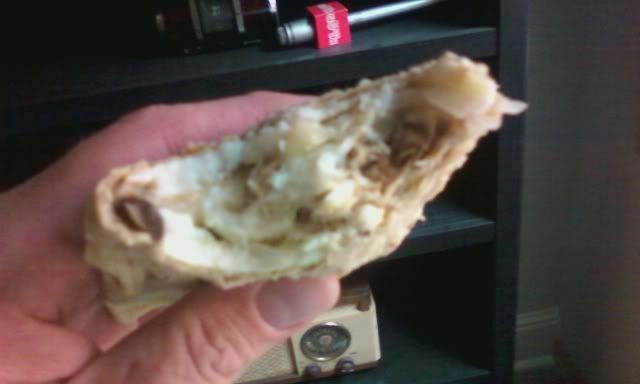 A recent breakfast---1/3 a Joseph's Lavash wrap, with eggs, mushrooms, onions, and mozzarella. Wow---just amazing, and LOW calorie!! 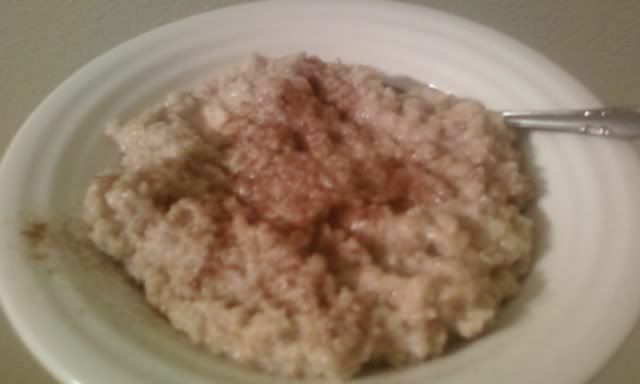 Occasionally, I prefer Steel Cut Oats for breakfast---1/2 a banana, a little Splenda, a dash of milk, and some cinnamon---Oh my, it's a nice 200 calorie breakfast!! If you like Oatmeal...my facebook friend Jamie recently expressed his dislike for Oatmeal on my facebook wall---and he's absolutely right. Never eat something just because you hear it's a weight loss superfood. I told him, "I eat what I like and nothing I don't," you know me! Jamie has lost 75 pounds in 13 weeks!! With Jeanne Votaw. Jeanne has lost 160 pounds and kept it off now for well over a decade. It was fantastic to see her and her husband Jim the other evening! 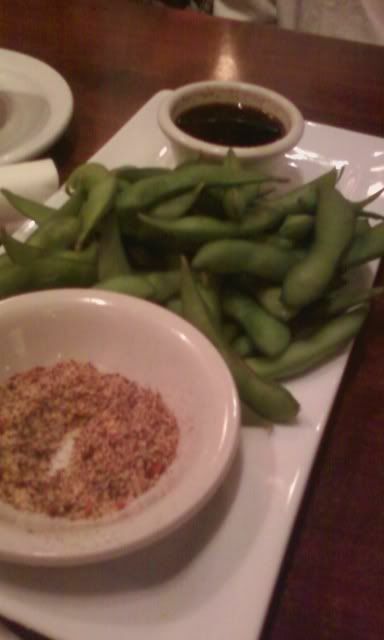 Now this, this is one of my favorite appetizers!! 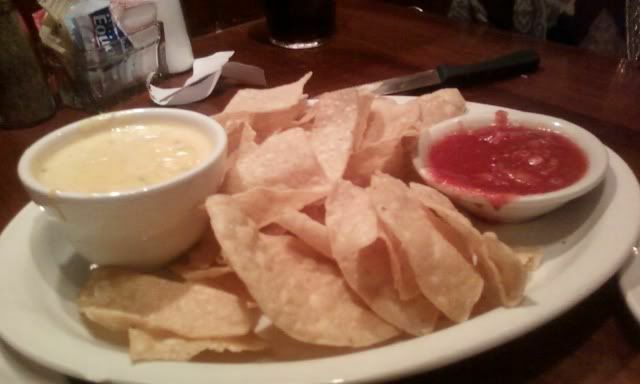 ;) I enjoyed a few chips and salsa--and just two or three dips into the cheese---oh my, it was amazing! 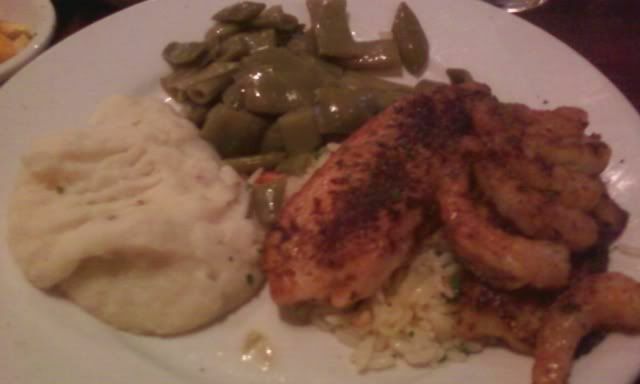 My grilled Talapia dinner with little grilled shrimp on top, Italian green beans, and mashed potatoes--sans gravy. Outside Cheddars waiting on our table to open...with Amber, and wearing my new shirt that Sherri and Terry gave me as a birthday present. Thank you Sherri and Terry!! 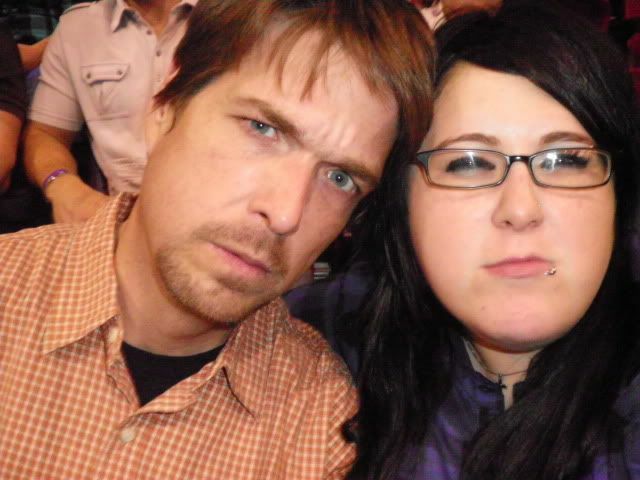 Amber and me, with our serious mean faces "on." 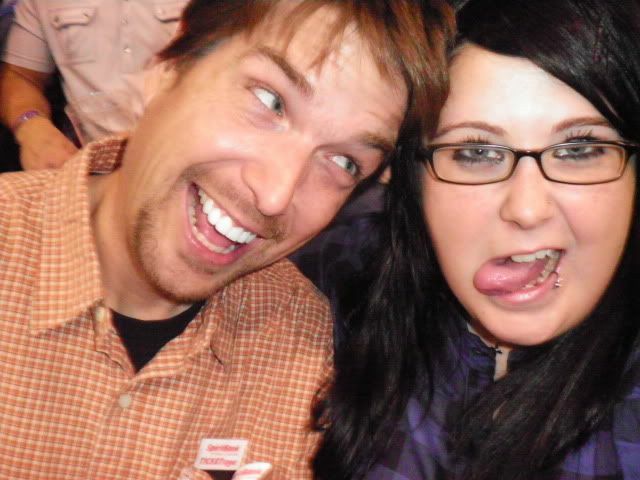 Amber and me, with our silly-crazy-fun faces "on." 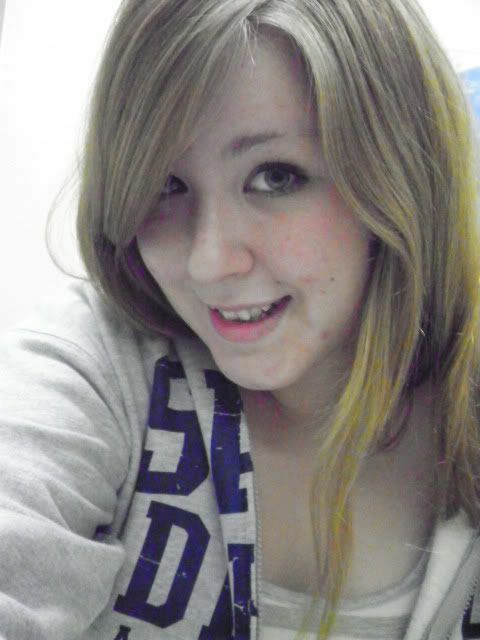 My incredibly beautiful, talented, smart, mature beyond her years, loving and amazing daughter--Amber. She's a gifted special education major at SWOSU. I'm a proud daddy! 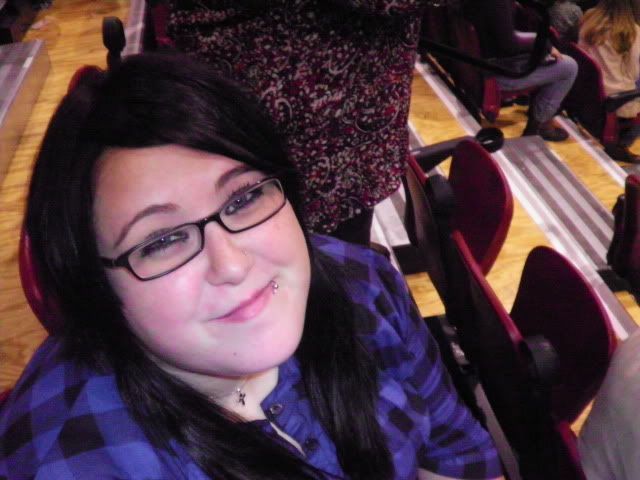 Me--solo picture---at the concert. Love my new birthday shirt! 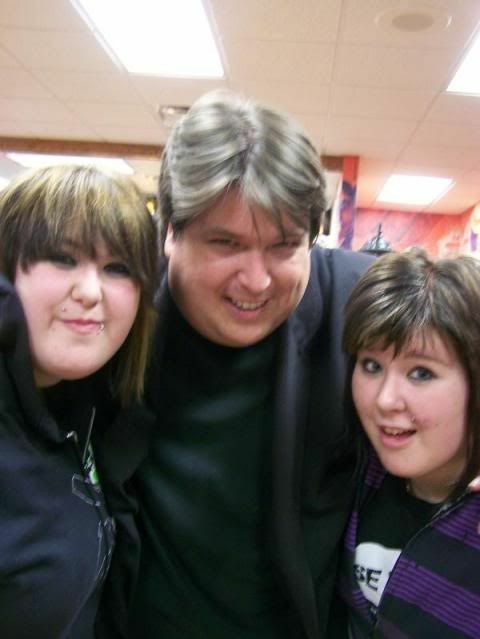 Big before picture---Over 500 pounds, with my two daughters--maybe three years ago! Oh, how things can change in three years!! Day 754-758 Busy Days, Different Focus, and Living In This New "Normal"
Busy Days, Different Focus, and Living In This New "Normal"
Life seems to be busier than I'd like it to be right now. My focus needs to be on writing, but it seems that I'm allowing myself to get consumed with a busy schedule. When I do find time to write, it's usually without much time to disconnect and wind down, leaving my mind on things that need to be shoved aside for reflection and clarity. With that said, I'm not complaining, I'm loving life completely, and when I do have a productive writing session, it feels amazing. I've had to do something lately that I've never been good at doing, and that's saying "no." I've said "no" at least four times in the last week. And it's especially tough when the "no" is given to a really worthwhile cause or function. But right now, I must focus and keep a tight schedule. In a perfect world, I'd disappear for several weeks, then emerge with a manuscript complete...turn off everything, and just write about this journey. As wonderfully fluffy and romantic as it would be, life and responsibilities don't yield for my writing schedule. But really, when I think about it, that's the only way it should be--just as I've lost this weight in the middle of a regular life, full of stress and ups and downs, and work schedules, and sadness, and craziness, and every emotion--good and bad. This has never been a retreat to a ranch somewhere with specialist and trainers, this is real life. And I take pride in that fact. So I guess I should naturally embrace the evolution of my wonderful new existence and projects, while navigating everything that life as I know it, requires of me. It's all wonderful, really. I never forget how blessed I am, to be where I am...this is incredible. It's a dream come true, this new man staring back at me in the mirror...so wonderfully different in so many ways, yet still the same in many others. I'm navigating this transformation the best way I know how---trying hard to understand that I can do it all, just not all at once. I had to say no to an opportunity to repel off the side of a skyscraper in downtown Oklahoma City with Special Olympics. That would have made for an incredible experience, but the event was a two day commitment. I'm so deathly afraid of heights, I'm not sure I could have handled it really, without getting sick and panic stricken, but either way--it was a wonderful cause for Special Olympics Oklahoma and it would have been an amazing photo opportunity for me. My word, I must overcome my fear and do that sometime...or go hot air ballooning or skydiving, two things on my "when I lose this weight" list of things I want to do. Well, here we are, at a size without restrictions--but, oh yeah---I'm busy...but not busy forever. The day will come. All in good time, right? I'm never done learning, I have much to learn, but my journey is very different now. Eating like a normal person and being a normal size, is becoming me--naturally. In other words, a bunch of the things I've written about, just come automatic to me now. So this blog is increasingly difficult to write...because I'm not constantly trying to right the ship anymore. That's the main reason I always suggest to people new to this blog, to go back and read from day 1. I get a bunch of feedback concerning the sporadic posting schedule of late, but you must understand--I posted everyday for twenty-two months straight---and it's all there, when and if you're ready to read. You don't get the full story or get to share in the life changing epiphanies I've experienced, unless you do. Don't get me wrong, I'm not quitting this blog at all...couldn't, wouldn't...but, I guess...I'm struggling with the changing schedule--and these sporadic post, well--honestly, I hate it. I'd rather write every single night, just like in the beginning. Everything from THAT DAY is so fresh and easy to write about, but there's no time for that kind of commitment anymore. That schedule has served its purpose very well, I'm a transformed person as a result of this blog and all of the choices that have brought me here. Just bare with me, please. 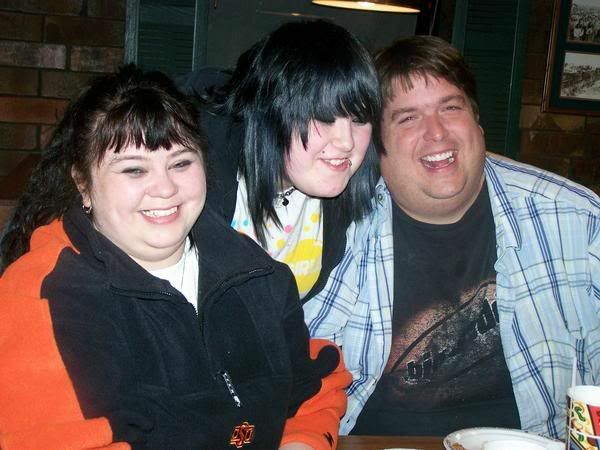 I've written in these blogs how I've never been a stereotypical 500 pound eater. I've never consumed unimaginable amounts of food in one sitting. But I have been an “impulse” eater. I was reminded of that today when paying for gas at a convenience store with a deli case full of fried everything. I'm immediately drawn to that deli case like a bee to a picnic area trash can. The egg rolls are better than any I've ever tasted at an actual Chinese restaurant. The burritos are crispy on the outside and deliciously soft on the inside, and the corn dogs were on sale two for a dollar! There is absolutely no way the old Sean could have gone in there without at least buying two corndogs for a dollar! That's just being a smart shopper...and an impulse eater. Because it wouldn't have mattered that I just had dinner or was about to have dinner. If I wanted that taste, I was going to have it. It got so bad at one point that I would “sneak” eat. For example, I'd be leaving work, I'd call Irene and she would describe a wonderful meal that was almost ready. My plate would be waiting as soon as I arrived, and still on the way home I would “sneak” eat a bean burrito...or a bag of chips...or a couple of egg rolls. Irene would ask me questions like, “so, what have you had to eat today?” And I would do my best to lie to her, but after you've been together nearly two decades, it gets really hard to get away with a lie. She knows all my tells. She's also a great detective. So as you can see, it's not necessarily gigantic portions in one sitting that has made me this big, it's impulse eating throughout the day and into the night. Let's call it “over nibbling”, Ok---Let's call it what it is: Food addiction. There, I admitted it! They always say that admitting the problem is the first step to recovery right? I'm a food addict pure and simple. I very rarely eat because I'm hungry, I eat because I want it! You can tell that over the years I've become well acquainted with me and my dysfunctional eating habits. I've dug deep to understand my bad habits, but even armed with this information, knowing how I am, and the negative effects of my behavior, I'd still do it. I'd probably have to undergo professional psychiatry to go deeper into understanding why I developed these eating patterns, but I've gone deep enough on my own to identify them, and I think getting any deeper would just reveal “excuses”. I'm finished with excuses. I'm changing my deadly habits now. And it feels good! Every time I easily click that seatbelt, I'm reminded of my success so far. Remember me talking about the “results snowball effect”. It's very true. Positive results are a powerful motivator to continue doing the right things. And the more right things I do, the more results I get, the more motivated I get. I spent the majority of my writing time over the weekend, staring blankly at the computer screen, at a loss for words. And that's too bad, because starting with Sunday evening--my schedule was mapped out for the next several days. 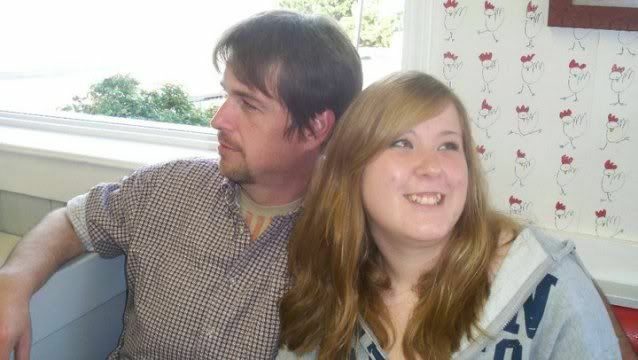 I had a very nice dinner out with Courtney, my youngest, and her boyfriend Brad on Sunday, before heading to the campus of NOC for rehearsal of an event that was scheduled for Monday night. The event was something I agreed to do a while back and I must say, I'm glad I did. It was an evening of Broadway with ReAct, Regional Actors Community Theater. 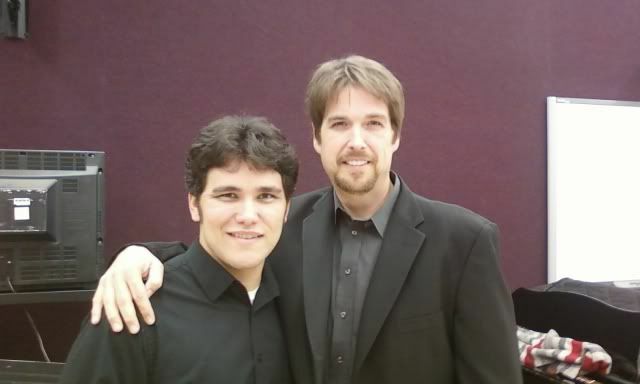 The entire event served as a fundraiser for the music theater scholarship fund at NOC. I'm so impressed with the amazing talent we have around here...wow, it's really incredible. The event was an opportunity to work with Eddie Dixon, a music professor, and fellow weight loss champion. 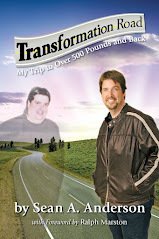 Eddie has lost 165 pounds and kept it off for several years now. In talking with Eddie, we share many of the same weight loss philosophies. We've both lost the weight naturally and he really understands my excitement over being a normal size. He's been there too, he knows. Tuesday was a full day at the studio and a full night at the Marland Mansion for an annual event hosted by Team Radio. As the KPNC morning personality, I was at this event called "Ladies Night Out," greeting the ladies as they made their way into the mansion for a night of free wine, food, shopping, and registering for thousands of dollars in prizes. I've been required to attend this event every year for the last five years. I was over 500 pounds at the first two, and over the course of the last three events, dropped the weight. The "wow" reactions were numerous last year at this event, but this year---oh my, it was over the top. The compliments came fast and often all night long, everywhere I was, here came another...and it was so much fun!!! Listen, after being as big as I was for as long as I was...it feels amazing to no longer feel like I'm the least attractive person at an event like this...I'll stay perfectly grounded, but wow--my self-esteem and confidence was boosted all night. Thank you to everyone that contributed to this indulgence. I enjoyed the tuxedo and the attention, who wouldn't?--and coming from where I do, I refuse to feel bad about that enjoyment. Wednesday was another full workday followed by a four hour broadcast from a casino. My day started before 4:30am and ended around 7:30, with a wonderful baked cod dinner. The cod is new to my lineup of choices...Talapia isn't...I believe I have a picture of a recent talapia dinner I prepared. I was so tired and hungry Wednesday night, I was half-way finished with my baked cod meal before I realized tat I hadn't snapped a picture. Oh well...that's cool. Normal people don't take a picture of everything, right? Trust me, it was an amazing dinner. Thursday morning started with 1/2 a Joseph's Lavash bread wrapped around three egg-whites, fresh mushrooms, mozzarella, and a small talapia filet. I know!! Fish for breakfast??? Yes, yes, YES!! It was amazing, and only 210 calories for the entire thing! 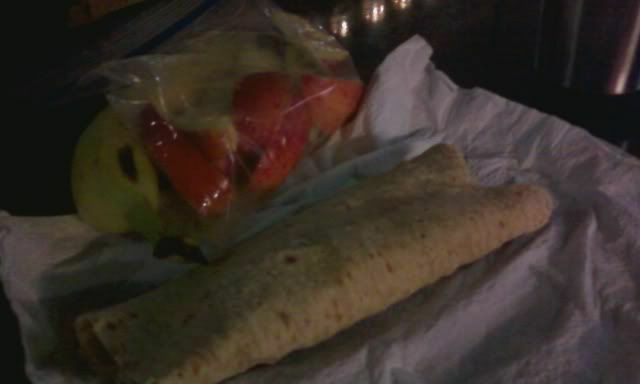 I loved it--and along with my lemon marinated apple slices and a banana, plus coffee--I was set for a good day. 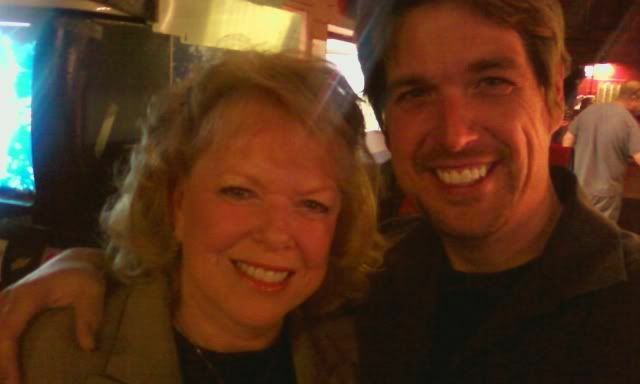 I left the studio early today, headed for Stillwater--to weigh-in and write this blog post, and...shhhh...Uh, surprise mom with a visit!!! She doesn't know I'm coming!! I'm not sure what to expect at weigh-in. Given my weight loss in the last few months, I seriously doubt I've dropped five pounds, hitting 230 today. But one thing is for sure...it will happen, if not today...next time. And I'd really love to have Irene and my daughters there for that one...and I don't even mind if they all bring their boyfriends...I just want them there. If it happens today, and I guess it could---I may have to rally the staff at the health department. They should at least be warned about the potential craziness that would come directly from the scale, should I see 230 today. OK--I must wrap--Thank you so much for reading and following my progress and life. There are wonderful things on the horizon...not sure it's even imaginable at this point---but it will be, incredible. I hope you'll facebook friend request me and also, I'm trying to get back in the Tweeting habit. You can find me on facebook by searching it using my email seanboy105@hotmail.com On Twitter, I'm @SeanAAnderson --The middle "A" stands for Allen, my middle name. 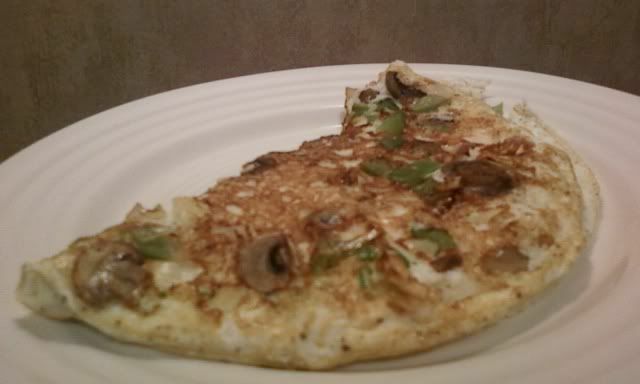 A recent breakfast---a nice big low cal veggie omelet, this one with chicken--if I remember right. 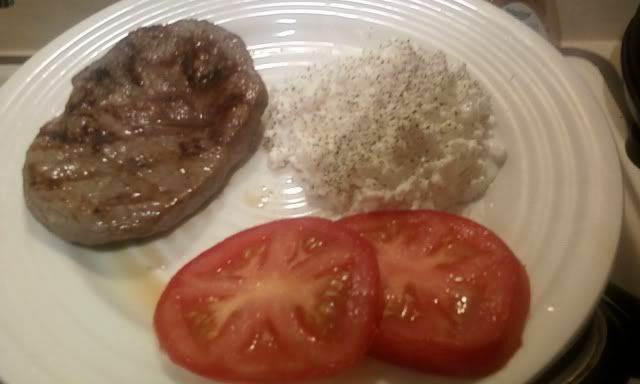 A recent dinner...I love my meat and potatoes!! And tomatoes, love them too! With Eddie Dixon...He's lost 165 pounds! And even better, he's kept it off for five years! 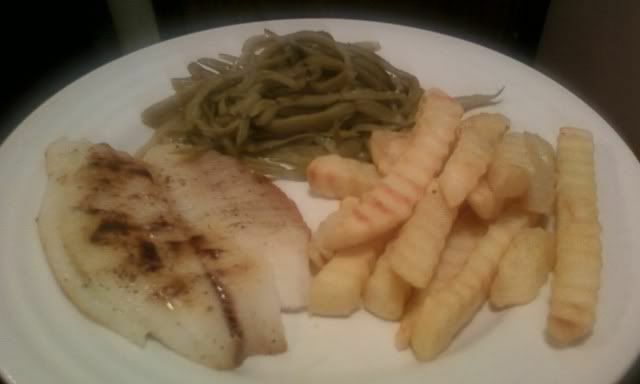 Talapia, baked crinkle cut fries, and French cut green beans...Oh my, delicious---all of it!!! 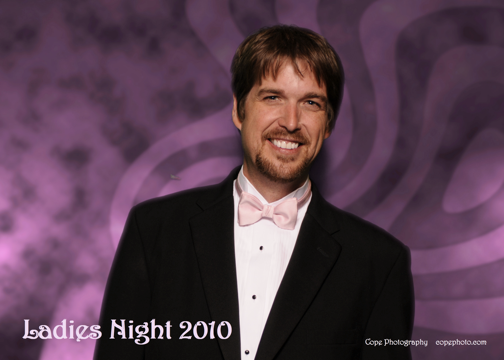 Professional picture--courtesy of Cope Photography...at Ladies Night. The pink tie was in honor of breast cancer awareness month...Dave May from KLOR, and I both proudly put on the pink! I'm really enjoying where I am at this point along the road. I'm getting more and more comfortable with myself, and I'm starting to realize exactly where I am and where I want to be, and most importantly: What is required of me to get there. I could easily settle right here, or a few pounds from here, at 230. But I know what I want probably will not magically happen in a few pounds. As "normal" as I might look in my clothes, it's what I see in the mirror--the for my eyes only stuff, that remind me, from a fitness standpoint and a loose skin standpoint, I've still a ways to go. Oh, but I've come a long way my friend, oh yes...this is an awesome feeling. And if added physical fitness, an eventual skin removal surgery, and an upcoming Colonix Cleanse take me well below or above 230, whatever...it's all good. I guess my point is this: It really can't be about a number. "The number" will reveal itself naturally in good time and effort. I've been dipping back into the archives two years, instead of one, and I love it. The basic foundation of this journey was outlined in those very early post. Going back and reading, to me, is like an exercise in positive personal affirmations, strengthening my weight loss philosophies and understanding that, the very basics were never really difficult. But I always made them that way. 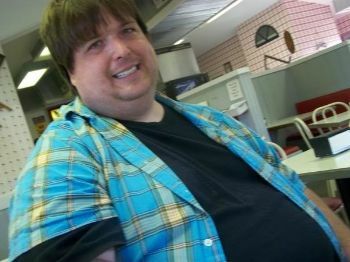 I look back at all of the years I struggled and feared my ultimate demise from morbid obesity. 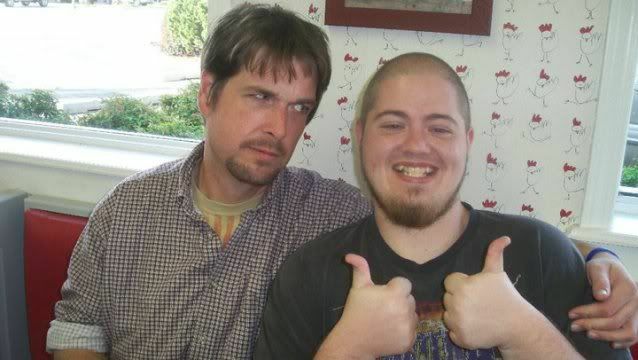 Back then, I never stopped to realize what I was doing to myself in terms of complicating this weight loss road. 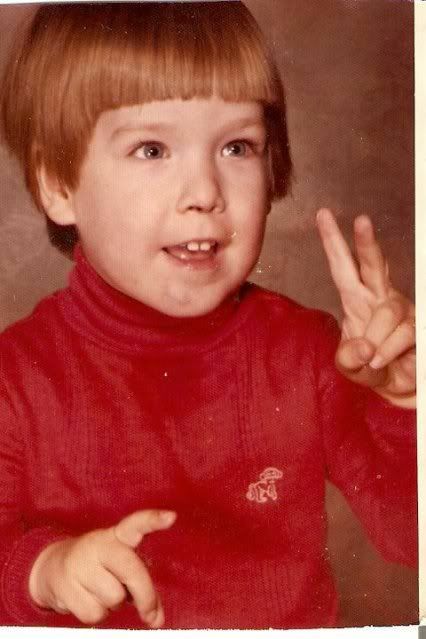 I was truly my own worst enemy. As contemporary pop artist Pink sings, I'm a hazard to myself--don't let me get me! Sometimes when the stress level goes way up and troubles rain down we search for a comfortable place to shield us from the storm. When our nerves are on edge we look for something to make us feel good again. We find comfort in food because it taste good and so many of our good memories are surrounded by good tasting food. Some people handle stress differently, instead of eating they go for a long walk and a good workout. For me and a lot of people the short term solution to feeling better is eating. It's a hard habit to break, but it's crucial to the life saving weight loss we desperately need. Instead of excuses why we can't possibly stay on track, we have to discover solutions to how we can. We have to understand that every choice is an important one. Remember that one bad choice often leads to another and it works the other way too. One good choice often leads to another. That's why I end every one of these blogs with “Good Choices”, because in the end we are the sum of our decisions, we can either be the victims of our poor choices or the champions of our good choices. “But you don't understand what I'm up against here”...No, maybe I don't know exactly what you're feeling inside and how it's effecting you, but I do know this: Overeating and making bad portion and exercise choices aren't going to make it better. I'm learning to love myself enough to make the good choices everyday. I said I'm learning, because I don't know everything, I'm not a doctor, I only know what I've put myself through all of these years. I only know and learn from what I've personally experienced over more than two decades of failed attempts. I've made excuses for years why I can't do this. Now I'm making solutions and good choices to show myself I can. As the days roll on, I notice I'm in a good mood more than ever before. Despite any troubles or various stress factors that come along, I'm still being positive and looking forward to the future. I know that exercise triggers a chemical change and the release of endorphins, and those little fellas make you feel really good. So maybe that explains it. Oh yeah, the weight loss too might have something to do with me feeling better on a daily basis. Something to remember: Not everybody is in a good mood. There have been several times over the last 23 days I've encountered people that were less than cheerful and friendly. Even friends and family can unknowingly send a negative vibe your way. One day my oldest daughter went to the YMCA and worked out real hard on the elliptical machine for a solid thirty minutes. After she finished she told a very good friend of hers at the time about her thirty minute workout. The friends response? “Next time you might want to try doing it a little longer”. Wow. Not a single “way to go!” or “nice job”. It doesn't mean that the person wasn't her friend, it's just that some people have a hard time being positive. I'm out of my 60 calorie Joseph's Pitas and I'm starting to get a little anxious. Wal-Mart is the only local source around here. Sporadic and unreliable are words that best describe their stock of these wonderful products. I guess I need to go online and order some more. A friend, reader, and fellow facebooker recently informed me that www.netrition.com has the pitas at the same price as Joseph's site, but with a flat rate $4.95 shipping. I'd love to order directly from Joseph's, but the shipping charges make me cringe. A flat rate $4.95 with Netrition, however they do it, sounds good to me. I've been coming across the number 505 a bunch recently. Maybe I'm just noticing it now, Hmmm, don't know. Several days ago, a friend at work had me pick up their lunch order while I was out---the total: $5.05. I ran into Wal-Mart the other day to grab a few items, the total was 14.95--my change from a twenty---$5.05. When I recently over-slept my nap, I woke up to the clock saying 5:05 pm...and here's the kicker: A new financial services card arrived with a security code of--you guessed it: 505 Coincidence, for sure, but still---very interesting...Hmmmm....You know, whatever we focus on is what we get back---it's the foundation of the Secret. As long as it comes back in these non-physical ways and my focus remains on who I've become and not what I was, then I'm fine--Sometimes it's hard to believe I was ever 505...but it doesn't take much to remind me, all I have to do is look around...and roll up my sleeve. On Monday morning October 11th at 7:30 am Central, 8:30 am Eastern, I'll be interviewed by Joy 102.5 FM in Maryland. It'll be a two part interview and you can listen as it's broadcast by going to http://www.wolc.org/listenNow/index.html The interview actually took place a while back...I'm thrilled that it's airing Monday morning...Very cool! Thank you Rodney Baylous and WOLC! Rodney found this blog from the AOL story published in July. What a wonderful blessing. Again, thank you Joy 102.5--and it was truly an honor and my pleasure! 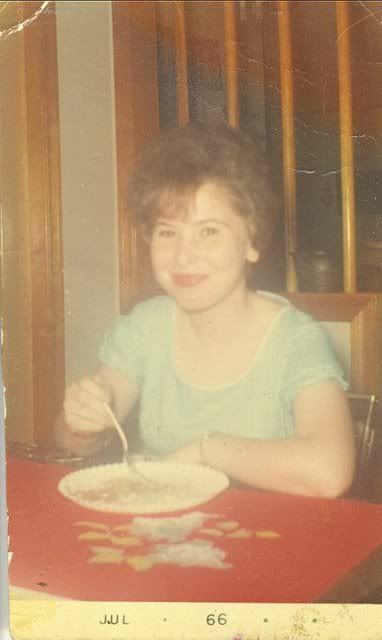 Me--at 13. I actually remember getting dressed that morning. I put on that blue collared shirt with a little penguin on the chest---and decided that the shirt was too clingy---and a nice over-sweater would make everything better. Isn't it amazing what we tell ourselves? I'm the one sitting down with a spoon in my mouth. Cousin Steve on the left, cousin Troy on the right. 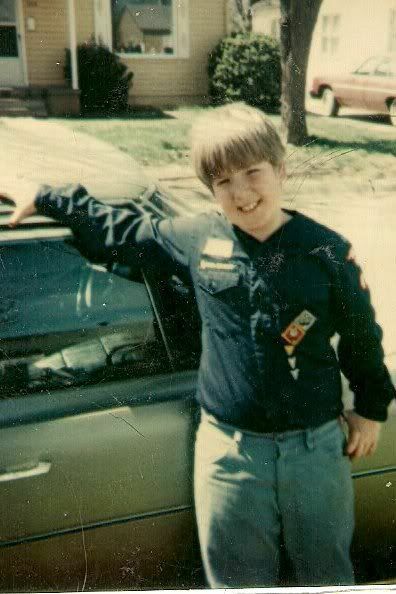 I guess I was a "tucker" at some point...about 8 years old I believe. 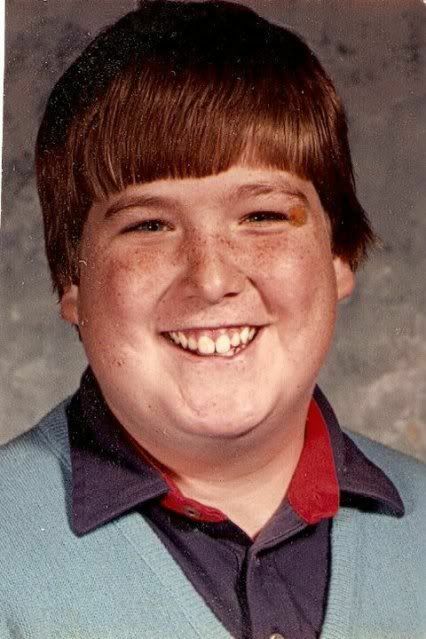 Wasn't really obese, just "husky" at this age. Cub Scouts rule. I'm three, wait---two...How do you make the three symbol? I'm confused, what am I doing here? 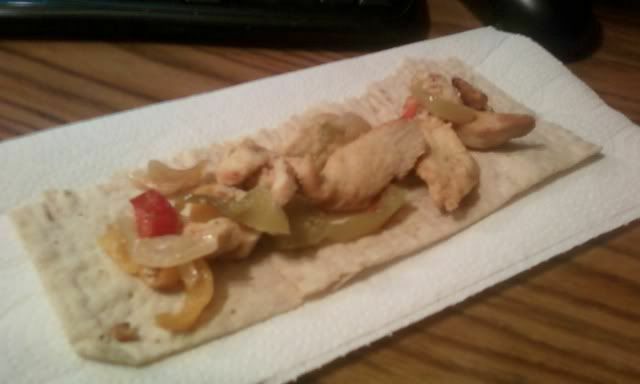 A recent 100 calorie snack---using 1/4 of a Jospeh's Lavash bread. A recent breakfast---Oh so good! Using a 1/2 Joseph's Lavash bread as a wrap for an amazing three egg-white, mushroom, and mozzarella scramble. Lemon marinated apple slices and a banana compliment this early morning metabolism starter. 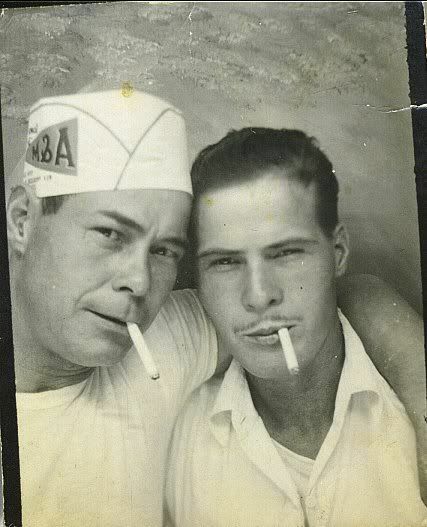 My grandpa on the right, and his brother, Uncle Ott on the left. Great picture--brave men! I know my grandpa was probably getting ready for war...he was so young here.